Yes, it it not even Thanksgiving yet, but if you are planning on sending out Christmas cards or newsletters this year, you might want to think about this. Christmas cards do require some preparation. Make a list. 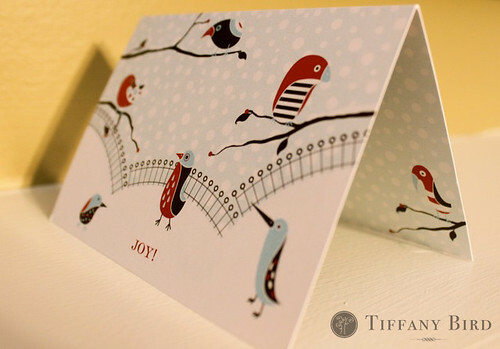 Begin by making a list of friends and family you will be sending cards to this year. Email people for updates of their addresses. To save time next year, you may want to keep this list somewhere safe or type it on a spreadsheet. You need to know how many cards to purchase or order. Narrow your list by taking off those you see all the time. You may also want to think about those you can email a holiday greeting to and save on paper and stamps. Order soon. Dec. 21 is the last day for you to send first-class mail and have it delivered anywhere in the U.S. by Christmas Eve. If you are ordering cards, photo cards, or personalized stamps, you will want to order them soon. Most orders take 3-5 business days to process then another 5-10 business days to arrive at your house. You will also need time to write a note, insert newsletter, address and stamp. Check the deals. It is that time of year where everything goes on sale and deals are everywhere. Check sites such a Retail Me Not for printable coupons or online codes. Size matters. Consider the size of the envelope. The maximum letter size for it to be $0.44 is 6 1/8″ x 11 1/2″. If you are unsure, you can check USPS rates here. Forgo lines. Don’t wait in the long lines at the post office. 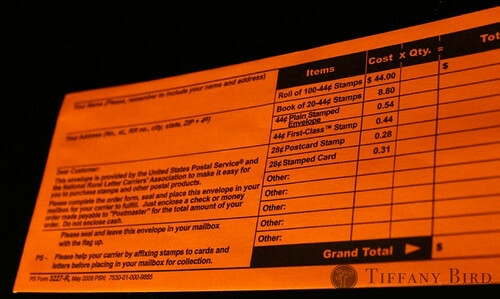 Order postage online or ask your mail carrier for an order envelope (see pictures below). You place your order on the envelope, insert a check, and the mail carrier deliver it to your mailbox the next day or two. No shipping or handling charges. Simplify newsletters. You don’t have to do it all in one sitting. Break it up, think ahead, write notes of things you would like to mention. Be creative. Have everyone write their own portion. Better yet, draw names and write a tidbit about that person in the family. One year we did a newsletter emphasizing numbers (number of trips we had taken, number of movies we watched, number of visitors in our home). Last year we used the alphabets to talk about our year. Family photos. Hiring a professional requires you to schedule early. This is one of their busy seasons. Alternatives may include asking a friend or neighbor to do some candid shots with your camera. Using a tripod and the camera’s timer.